When the citizens of Greenock took umbrage with their up-river neighbours in the 1670s, it is recorded that they rowed there to settle the argument. At that time, as it had been ever since man first ventured afloat, oar power – occasionally wind assisted – was the only means of transport across the Firth of Clyde’s relatively sheltered waters. In the centuries before the arrival of steam propulsion and good roads, any self-respecting laird would have a ‘galley’ and oarsmen at his disposal. A remarkable surviving example of such a vessel is the Marquess of Bute’s Lady Guilford of 1819, on display at the Scottish Maritime Museum, Irvine. Now, after many years in the doldrums, ‘coastal rowing’ is enjoying a strong and remarkable revival on the Clyde and a’ the airts. More on that, and on G.L. 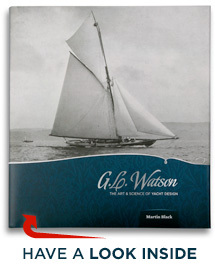 Watson’s part in rowing history with his RNLI lifeboat designs, later. Back now to 17th Century Greenock. The story goes that about one hundred inhabitants of the burgh – some armed – under the command of the laird, Sir John Shaw, rowed to Newark to reclaim one of their ships, confiscated to what would later become known as Port Glasgow by the representatives of the Royal Burgh of Renfrew over the matter of duties for foreign cargo. Violent disputes could be very local then; nowadays the barely four miles journey up-river in a car takes only a few minutes along a dual carriageway. Nevertheless, attacking Newark Castle would still remain a formidable task, as it proved for Shaw and his merry band. Much later, rowing on the Firth of Clyde became an artisan sport, with sometimes huge wagers taking place on the race results. The gigs were obviously well capable of dealing with local sea conditions, as seen in this introduction image to Chapter 3 from G.L. Watson – The Art and Science of Yacht Design, in which a moderate westerly appears to be raising a nasty short chop against the ebb tide. The book’s format required us to crop the original image seen above, while succeeding in retaining the essence of the scene, an engraving by Edward Duncan after the original oil painting by one of Greenock’s best 19th Century marine artists, William Clark. 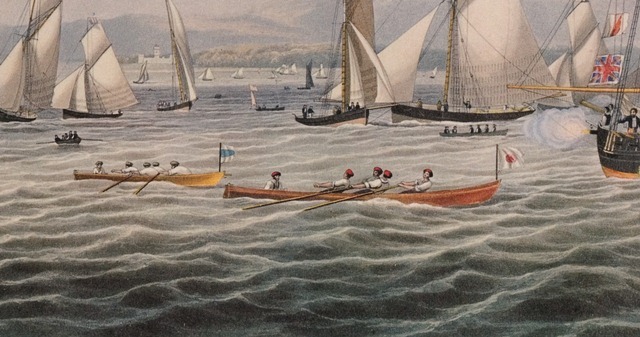 This wonderfully busy image of a Royal Northern Yacht Club regatta in the Bay of Quick, Greenock c.1837 lives up to its desired purpose of introducing a chapter on early yachting in Scotland; sight of the full original reveals that the centre of attraction is actually the rowing races. Comparison with one of William Clark’s originals of this event (he painted more than one) suggests that the engraver may have employed some artistic licence in giving the four-oared gigs racing flags, but the lads in red cowl or Tam o’Shanter hats remain. Who were they? What club, organisation, owner or patron did their colours represent? 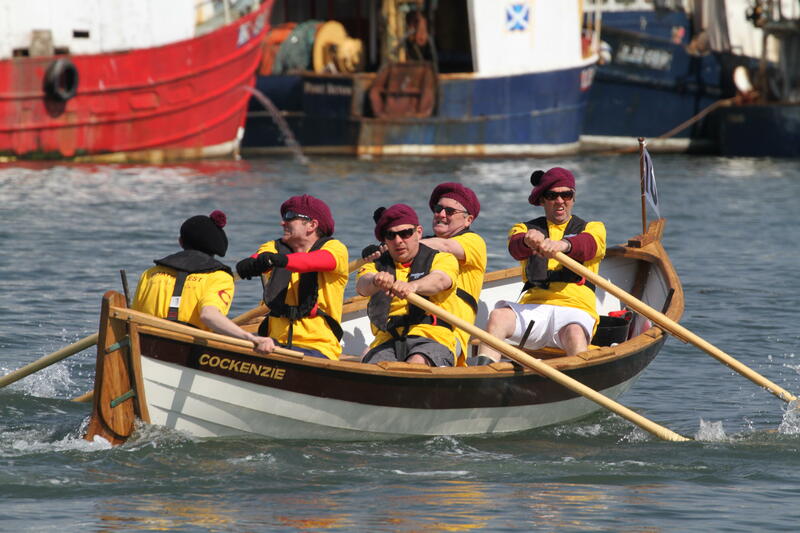 In the present century, the tradition of sea rowing is upheld at Greenock by the Royal West of Scotland Amateur Boat Club, which is moving with the times by embracing the Scottish Coastal Rowing Project. This entry was posted in art, Clyde yachting, G.L. Watson, rowing, yacht clubs and tagged coastal rowing, Greenock, Lady Guilford, Port Glasgow, Royal Northern YC, Royal West of Scotland Amateur Boat Club, Scottish Coastal Rowing Association, William Clark. Bookmark the permalink. There’s a lot we can learn here, Iain, not just the historical aspect. It looks as if the two middle rowers are side by side, do I remember that being called ran-dan? We’ll have to get some tammies for the boys and girls on Seil, I can see. Best wishes from http://www.scottishboating.blogspot.com. Ran-dan? Wasn’t that what the original Tam (o’Shanter) was on? But seriously: fascinating indeed. I noticed the strange (to me) seating arrangement, but perhaps the engraver has used some licence here as well; check it against the Clark original referred to… The engraver, Edward Duncan, was London based, so maybe that was a Thames thing? Check out more coming soon about G.L. Watson and oar power. Cool! So, Robbie, since the boats are all supposed to be the same 😉 , and the dress code must be competitively practical, the concours d’elegance must be of a millinery variety? It would be great to know more about those Greenock crews of the 1830’s.